Nice condo with updated furnishings. Closer to the beach than most places in Shipyard. What a way to celebrate our 60th Birthdays. My girlfriends and I celebrated our birthdays here & it turned out to be an excellent choice. The townhouse was beautiful, clean and comfortable. The owners were very accommodating to make sure our stay was enjoyable. They had some good suggestions for activities and restaurants. We will be back again soon. Villa is very clean and nicely decorated. It is great to have the bikes and the beach locker included. Great location directly across from the Van de Meer tennis center and only a short walk to the beach. We have stayed in many condos over the years and this condo was one of the cleanest and best equipped of any. The unit is close to the beach (walking distance) and the owner supplies a beach locker, which is a nice add on. Also, the unit comes with 2 bikes so you do not have to rent, another nice add on. The unit has notes with hints for the renter about trash pick up, tv remote, places to visit, and a magazine with some restaurant suggestions. We will definitely consider renting here again. Very clean and comfy condo, unbeatable location in Shipyard! Great condo! 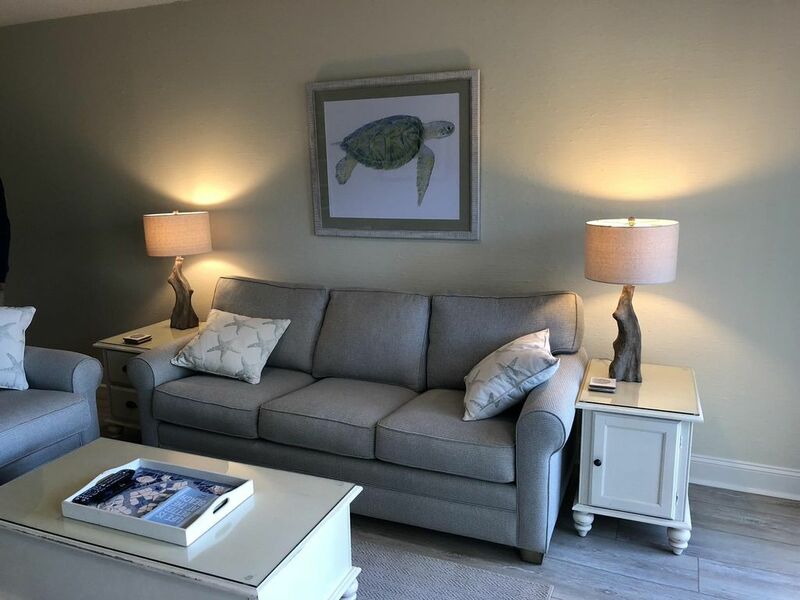 I love staying in Shipyard and this unit is about as close to the beach as you can get in Shipyard! It is in the neighborhood called The Greens, right next to Beachwalk. But its precise location within The Greens makes the walk to the beach much shorter than some. This unit is updated nicely with granite in the kitchen and bathrooms. Also new "wood-look" flooring on the main floor. When we first walked in, it seemed a little dingy and dated, but that was a wrong first impression. The floorplan of these older units is just a bit hard to work with. So it is not as bright and airy as some, but the updates are nice and we enjoyed our stay very much. It obviously is well maintained. Kitchen and bathrooms are a bit small, but everything worked well. Nice back porch overlooking the golf course. Having the beach locker was helpful because we could ride our bikes to the beach and not have to carry chairs. Alex was super accommodating and very responsive. He gave excellent recommendations for restaurants and activities. I definitely will stay here again. We loved our stay at Alex’s condo! The location is so perfect just a quick walk to the ocean and the beach locker is amazing! The condo was super clean. Alex was a pleasure to deal with. We enjoyed the pool and golf course as well. Heritage Week is $1000/week. Rates are subject to change until confirmed.